Each of these volleyball skills have a number of specific techniques that have been introduced over the years and are now considered standard practice in high-level volleyball. A player stands behind the inline and serves the ball, in an attempt to drive it into the opponent's court. His or her main objective is to make it land inside the court; it is also desirable to set the ball's direction, speed and acceleration so that it becomes difficult for the receiver to handle it properly. A serve is called an "Ace" when the ball lands directly onto the court or travels outside the court after being touched by an opponent. Sky Ball Serve: a specific type of underhand serve occasionally used in beach volleyball, where the ball is hit so high it comes down almost in a straight line. This serve was invented and employed almost exclusively by the Brazilian team in the early 1980s and is now considered outdated. In Brazil, this serve is called Jornada nas Estrelas (Star Trek). Topspin: an overhand serve where the player tosses the ball high and hits it with a wrist span, giving it topspin which causes it to drop faster than it would otherwise and helps maintain a straight flight path. Topspin serves are generally hit hard and aimed at a specific returner or part of the court. Standing topspin serves are rarely used above the high school level of play. Float: an overhand serve where the ball is hit with no spin so that its path becomes unpredictable, akin to a knuckle ball in baseball. Jump Serve: This volleyball skill is an overhand serve where the ball is first tossed high in the air, then the player makes a timed approach and jumps to make contact with the ball, hitting it with much pace and topspin. This is the most popular serve among college and professional teams. Jump Float: an overhand serve where the ball is tossed high enough that the player may jump before hitting it similarly to a standing float serve. The ball is tossed lower than a topspin jump serve, but contact is still made while in the air. This serve is becoming more popular among college and professional players because it has a certain unpredictability in its flight pattern. The set is usually the second contact that a team makes with the ball. For this volleyball skill the main goal is to put the ball in the air in such a way that it can be driven by an attack into the opponent's court. The setter coordinates the offensive movements of a team, and is the player who ultimately decides which player will actually attack the ball. As with passing, one may distinguish between an overhand and a bump set. Since the former allows for more control over the speed and direction of the ball, the bump is used only when the ball is so low it cannot be properly handled with fingertips, or in beach volleyball where rules regulating overhand setting are more stringent. In the case of a set, one also speaks of a front or back set, meaning whether the ball is passed in the direction the setter is facing or behind the setter. There is also a jump set that is used when the ball is too close to the net. In this case the setter usually jumps off his or her right foot straight up to avoid going into the net. The setter usually stands about ⅔ of the way from the left to the right of the net and faces the left (the larger portion of net that he or she can see). Sometimes a setter refrains from raising the ball for a teammate to perform an attack and tries to play it directly onto the opponent's court.This movement is called a "dump". The most common dumps are to 'throw' the ball behind the setter or in front of the setter to zones 2 and 4. More experienced setters toss the ball into the deep corners or spike the ball on the second hit. 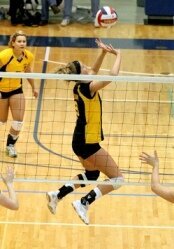 Also called reception, the volleyball skill of passing is the attempt by a team to properly handle the opponent's serve, or any form of attack. Proper handling includes not only preventing the ball from touching the court, but also making it reach the position where the setter is standing quickly and precisely. The skill of passing involves fundamentally two specific techniques: underarm pass, or bump, where the ball touches the inside part of the joined forearms or platform, at waist line; and overhand pass, where it is handled with the fingertips, like a set, above the head. Either are acceptable in professional indoor volleyball and beach volleyball, however there are much tighter regulations on the overhand pass in beach volleyball. The attack, also known as the spike, is usually the third contact a team makes with the ball. The object of this volleyball skill is to handle the ball so that it lands on the opponent's court and cannot be defended. A player makes a series of steps (the "approach"), jumps, and swings at the ball. Ideally the contact with the ball is made at the apex of the hitter's jump. At the moment of contact, the hitter's arm is fully extended above his or her head and slightly forward, making the highest possible contact while maintaining the ability to deliver a powerful hit. The hitter uses arm swing, wrist snap, and a rapid forward contraction of the entire body to drive the ball. A 'bounce' is a slang term for a very hard/loud spike that follows an almost straight trajectory steeply downward into the opponent's court and bounces very high into the air. A "kill" is the slang term for an attack that is not returned by the other team thus resulting in a point. Backcourt (or back row)/pipe attack: an attack performed by a back row player. The player must jump from behind the 3-meter line before making contact with the ball, but may land in front of the 3-meter line. Double quick hit/"Stack"/"Tandem": a variation of quick hit where two hitters, one in front and one behind the setter or both in front of the setter, jump to perform a quick hit at the same time. It can be used to deceive opposite blockers and free a fourth hitter attacking from back court, maybe without block at all. The volleyball skill of blocking refers to the actions taken by players standing at the net to stop or alter an opponent's attack. The jump should be timed so as to intercept the ball's trajectory prior to it crossing over the net. Palms are held deflected downward about 45-60 degrees toward the interior of the opponents court. A "roof" is a spectacular offensive block that redirects the power and speed of the attack straight down to the attacker's floor, as if the attacker hit the ball into the underside of a peaked house roof. The volleyball skill of digging is the ability to prevent the ball from touching one's court after a spike or attack, particularly a ball that is nearly touching the ground. In many aspects, this skill is similar to passing, or bumping: overhand dig and bump are also used to distinguish between defensive actions taken with fingertips or with joined arms. Some specific volleyball skills are more common in digging than in passing. A player may sometimes perform a "dive", i.e., throw his or her body in the air with a forward movement in an attempt to save the ball, and land on his or her chest. When the player also slides his or her hand under a ball that is almost touching the court, this is called a "pancake". The pancake is frequently used in indoor volleyball.